Psychotropic medication is often prescribed to children on the autism spectrum without full knowledge of the risks and benefits to that individual child. 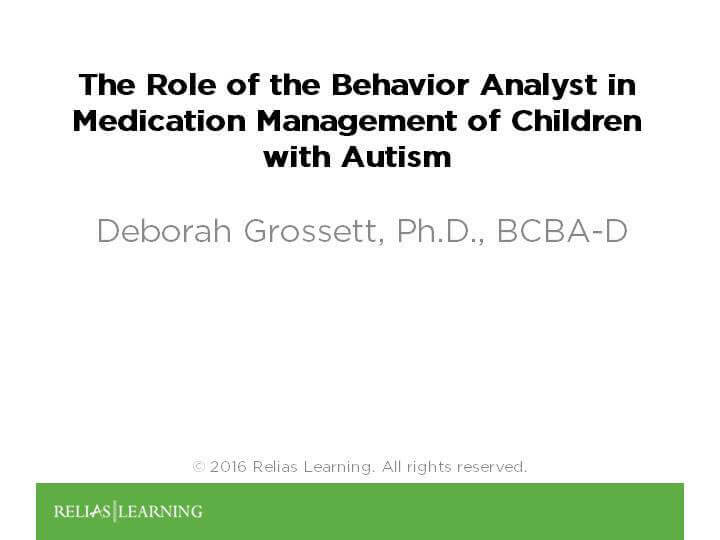 This webinar will assist attendees in understanding their role as behavior analysts in working with children who have been prescribed these medications. *Participant complaints regarding this or any other BACB CE event requirements violations must first be directed, in writing, to the Relias Learning ACE Coordinator, Rhonda Davin, PhD. Please contact Dr. Davin via email: [email protected] The ACE Coordinator will make every reasonable attempt to resolve participant complaints; however, should the ACE Coordinator be unable to resolve the complaint, the complainant may file a formal complaint directly with the BACB. Dr. Grossett obtained her Ph.D. in psychology from Western Michigan University. She is a Board Certified Behavior Analyst at the Doctoral level (BCBA-D), board certified in advanced psychopharmacology by the International College of Professional Psychology, and a licensed psychologist in Michigan and Texas. She has over 30 years of experience working with individuals diagnosed with autism spectrum disorder, intellectual and developmental disabilities, and related conditions. She taught has undergraduate and graduate courses in psychology at Central Michigan University and the University of Houston – Clear Lake. She has published journal articles in behavior analysis, behavioral pharmacology, and developmental disabilities. Disclosure: Deb Grossett, Ph.D., LP, BCBA-D has declared that no conflict of interest, Relevant Financial Relationship or Relevant Non-Financial Relationship exists. The target audience for this course is: intermediate and advanced level Behavioral Analyst; in the following settings: Intellectual Developmental Disabilities.